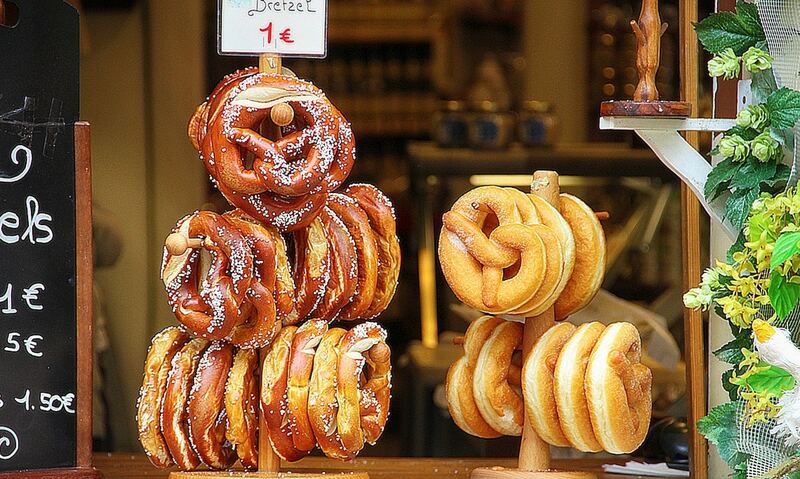 As a German, a native Bavarian moreover, I’ve always found it difficult to resist anything pretzel related. They are simply the ultimate savoury, yeasty addition to a hearty meal (and beer). However, before I go on I must make a point of stating that for the sake of authenticity, all pretzels will from here on be referred to as Brezeln, since the English term, and the corresponding baked good, simply does not do the original justice. So, with the formalities out of the way, let me get back to declaring my affection: There is rarely anything more satisfying than having your teeth crack through that fresh, crunchy, Laugen-covered, salty-yet-smoky crust, only to get to an even more pleasing soft, warm, fluffy centre. Add a little butter to the mix, perhaps some chives, and you’ve got yourself one of the most tastefully gratifying snacks. Did I get your attention? Good. Thus, why not, in honour of this prime, baked good, organise a festival centred entirely around the Brezel and everything accompanying it? The German town of Speyer, located in the district of Rheinland-Pfalz (Rhineland-Palatinate), decided to do precisely that and has been doing so for over 100 years. The 7th of July 2016 will mark the hundred-and-sixth year of the Speyerer Brezelfest; an annual, local event taking place over the second weekend of July and lasting up to six days, complete with a programme of parades, musical stages, food booths, beer gardens, and amusement rides. Originally commencing in 1910 as an initiative from the town’s tourist association in an attempt to promote local bakers, brewers, and tobacco manufacturers, one might mark this project as a success, as today the Speyerer Brezelfest is the largest Volksfest (beer fest + funfair) of the Upper Rhine region. Naturally, today the festival has expanded in size and duration, yet maintains many of it’s original traditions, such as the Brezel booths, beer tents, and team activities. Speyer itself, having been founded by the Romans, is one of Germany’s oldest towns and still maintains a great deal of its historic structure and architecture. Together with approximately 50,000 inhabitants, Speyer is the home of an Imperial, over 1000 year-old cathedral, a neo-gothic Protestant memorial church, and a profound, Jewish legacy. Tourists furthermore come to the city for the great hiking and cycling opportunities surrounding the city, but also for the region’s exquisite wine. In 2013 the Speyerer Brezelfest earned the city an entry into the Guinness Book of World Records when over 1973 participants were counted proudly wearing a Dirndl; a traditional dress primarily worn in the southern regions of Germany, as well as Austria and South Tyrol. An additional (unofficial) record was made when in 2014 more than 2,000 people participated in the traditional Dirndl-Lederhosn-Polonaise line dance. These numbers alone are a testimony for the size and enthusiasm surrounding this festival. This year’s edition will carry no particular theme, however will again be serving the ever so popular, regional, and authentic Eichbaum beer and of course the traditionally prepared Brezel. Both will surely be devoured with a sense of local loyalty, contentment, and conviviality. If history is any kind of indicator, the Speyerer Brezelfest will only continue to grow in size and popularity and will soon be attracting international beer, party, and Brezel aficionados, still supporting local producers over 100 years after it’s beginning.